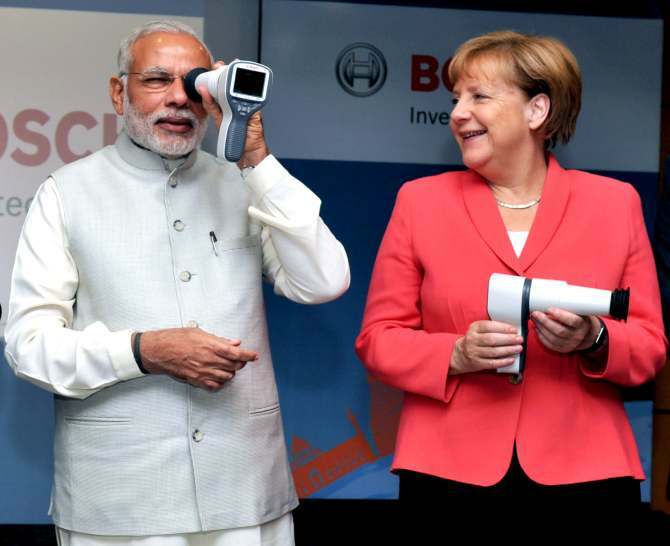 Prime Minister Narendra Modi shared a light moment with German Chancellor Angela Merkel at the Robert Bosch Engineering & Innovation Centre, in Bengaluru. Wonder, what NaMo is up to? Let your imagination run wild (READ: NOT ABUSIVE) on giving a suitable caption for this photograph in the message board below. Caption this: What did Rahul show Sonia on his phone? Caption this: What's Modi up to? Caption this: Modi's got a gun! Caption this! What did Modi tell the aboriginal dancers? Caption this! What did Namo tell Vlad?